A deanship is now seen as more of a phase in an overall academic career than as a permanent shift from teaching to administration. In fact, the nature of the job itself has changed, as has the range of likely options at the end of a dean's tenure. This book serves as a guide for the aspiring or new dean, offering practical advice on how to approach the interview process and the new job, as well as providing a thoughtful assessment of the deanship in its wider context. 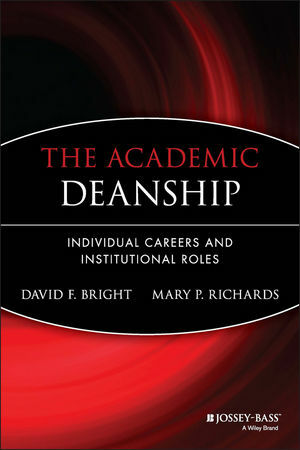 The authors--both experienced academic deans at a variety of institutions--encourage the new or experienced dean to reflect on the larger issues, and address the realities of deaning from several perspectives in efforts to illuminate both the challenges and rewards of the job. David F. Bright is professor of classics and comparative literature at Emory University. He has held a variety of administrative positions ranging from department chair to vice president to dean of arts and sciences. He has held deanships at three institutions. Mary P. Richards is professor of English at the University of Delaware. She has held six deanships or associate deanships at various institutions, most recently as dean of arts and science at the University of Delaware. Part 1 Becoming A Dean. 1 The Map and the Crossword: Ways to Think about Being a Dean. Deaning as Part of an Ongoing Academic Career. 2 What It Takes to Be a Dean. Necessary Skills and Expected Duties. How Do I Match Up? Do I Want a Deanship? 3 Finding the Right Position. Part 2 Administering the College. 4 The Shift to the Dean's Office. Setting Up and Settling In. 6 Departments, Programs, and Their Leaders. Dealing with the Multiple Identities of Departments. Working with Departments and DEOs. Part 3 The Work of the Dean. Where and How to Begin: Top-Down or Bottom-Up? When There's Month Left at the End of the Money. 10 The Dean's Role in Academic Programs. The Dean's Responsibility to Students. The Dean's Office and Students. 12 Legal Issues and Other Special Challenges. Special Challenges for Women and Minority Deans. Part 4 Beyond the College. Establishing a Relationship with the Provost. The Importance of Communication and Candor. 14 Other Deans and Directors. Deans as a Natural Cohort. Working with the Other Deans. Cooperating on the Academic Agenda. The Wider Community of Deans. 16 Beyond Deaning: Building a Balanced Career.